According to reports and comments, this module is not compatible with Sitecore 7.2 (and up). The code is available on Github for anyone to grab a copy and fix the problem. If you do, please be kind and share the solution (or send me an email and I’ll update the code). It took long enough, but I finally finished a 1.0 version of the LinkList field type I was working on a while back. Unfortunately, somewhere along the way I lost the source code so I had to use ILSpy to get it back. ILSpy is a great tool for checking source code (I use it ALOT) but it doesn’t always generate pretty code as it is, in fact, IL code. Therefor, I will not publish the source code at this time (unless you really need it, then just email me or drop a comment here). I wanted to handle links as content, not separate items, so I wanted to build a field type for it. 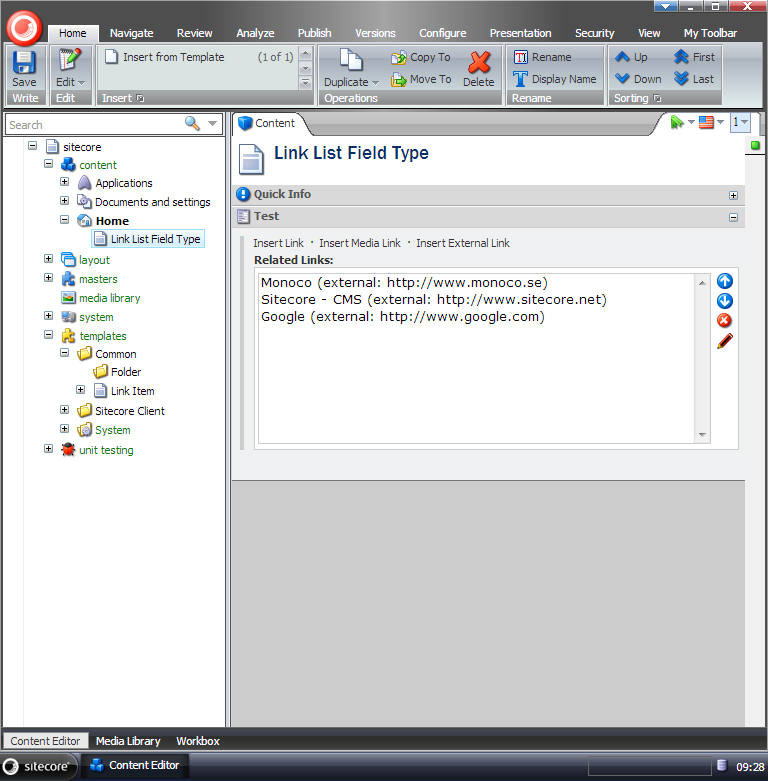 Initially I wanted it to contain Sitecore.Data.Field.LinkField but was unable to find a way to populate it. 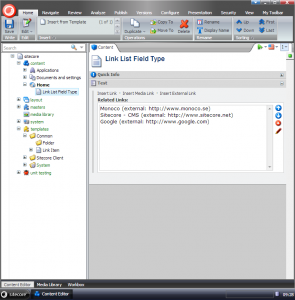 Without further ado; I give you Monoco LinkList Field Type as a Sitecore package. The package contains the field definition item (installs under /sitecore/system/Field types/List Types in core db). Just create a new field on any template with the “Link List” field type and you’re set. To access links, cast a field (LinkList field, that is) to Monoco.CMS.Fields.LinkList and go for the Links property, then bind it to a repeater or whatever you like. Not strictly on topic, but if you’re not happy with ILSpy decompiled code, then check out the results of JetBrains dotPeek (my preferred one currently) or Telerik JustDecompile. Or the trial version of Reflector. You’re much more likely to get feedback from others when you Sitecore module is on Shared Source. I really this module and i have used it for other projects, but now i am working on a new project and it does not seem to work. Do you have an updated version of this module that will work in the new version of Sitecore? I’ve heard others having problems with the 7.2 release of Sitecore. Unfortunately, I don’t work on Sitecore projects at the moment so I can’t really fix the problem. The code is available on Github, feel free to grab it and see if you can fix it: https://github.com/monoco/Monoco.CMS.FieldTypes (and please share the solution if you do). I will share it on github soon. Is it possible to share this solution? We are looking into using this module on a sitecore 7.2 solution soon and it would be good to have a fully working version. Did any one else have faced issues when If the link is too long, the buttons will move outside of the visible area and the user has to scroll to see them? Any solution found for this problem? We are using Sitecore 7.2 (rev. 140526). I’ve implemented a quick fix to make this works and seems to be working fine. I haven’t done much testing so I wouldn’t advise to use it on live environments without more testing. I changed the GetSelectText function a bit so it uses the Id of the internal and media links and displays the path of the item. I had to make changes to EditLink and InsertLink function but to be honest I’m not 100% sure of this fix and some things might not be neccessary.. I did quick search with IlSpy to see how Sitecore is doing this and came up with this solution. // Show the dialog using ShowModalDialog. I’ve committed a fix for 7.2, see https://github.com/MichaelHorsch/Monoco.CMS.FieldTypes/pull/1 for the code. This is a pull request on the MichaelHorsch fork as that fork has already done most of the heavy lifting for updating to 7. 2 Pings/Trackbacks for "A Shiny New Field Type: LinkList"